Peanut butter is one of those highly debatable foods. Some say it's healthy for you and others beg to differ. It's time to unveil the truth! High in calories and high in fat (good fat though, right?) are two ways to describe this smooth and creamy treat we love to put on bananas, celery and even ice cream. While peanut butter does provide your body with much-needed nutrients, it's important to remember that a little goes a long way. 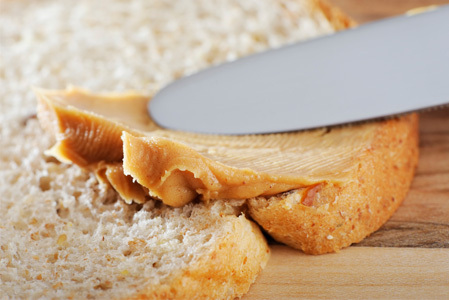 We've found that it's hard to eat just one serving of peanut butter, and, depending on the brand, it may actually be causing more harm than good. It's anti-aging. Peanut butter contains the antioxidant resveratrol — also found in red wine — which can help reduce the appearance of wrinkles. It's rich in nutrients. Peanut butter is full of vitamin E, calcium, iron, potassium and folate — all of which provide for better circulation and cardiovascular health. It can help fight cancer. Loaded with antioxidants, peanut butter can help reduce your risk for cancer and heart disease. Even in moderation, peanut butter does have a few disadvantages that are important to note. Typically, extra sugar is added to many common brands causing the calorie count to be even higher. To keep peanut butter from separating, cheap oils — such as palm oil — are added. Palm oil adds significantly more saturated fat to the already high-in-fat food. It's also very hard to eat just one serving. In other words, peanut butter is just a little too tasty, if we say so ourselves. Eating three servings will put you at more than 600 calories and 45 grams of fat — that's an entire meal's worth! Reduced-fat. Though reduced-fat peanut butter contains about 25 percent less fat than regular peanut butter, it's the good fat that's reduced. Surprisingly, it has the same amount of saturated fat (the bad kind) than regular peanut butter. Even if you're trying to lose weight, go for the full-fat peanut butter to maximize health benefits. Natural. This is by far the best type of peanut butter for you. It has no added oils to prevent the peanut butter from separating. Because of this, natural peanut butter needs to be stirred before each use. Make sure to choose the natural peanut butters with no added sugars or salt, as well.